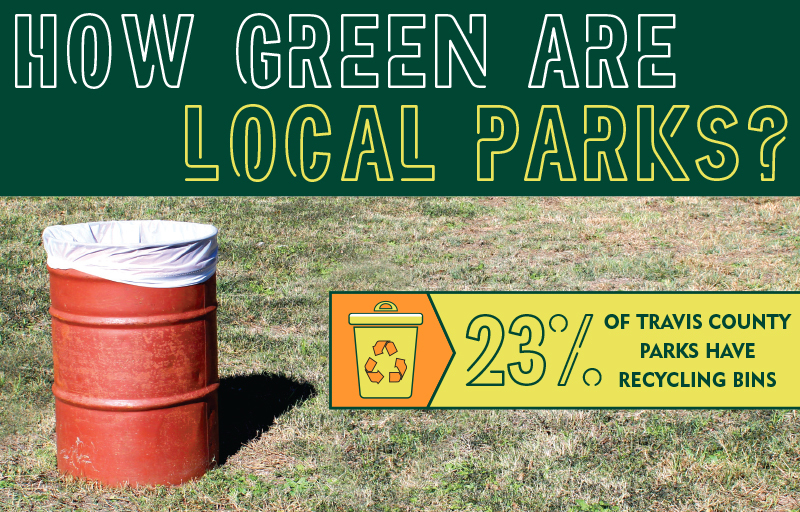 AUSTIN – Only six of 26 parks managed by Travis County have recycling receptacles, and many of those bins are dated and in need of replacement, said Shaun Auckland, conservation coordinator for the county. “Implementing a robust recycling program and educating the public on what can and can’t be recycled is substantial for us to be able to reach our 90% zero-waste goal,” Auckland said. The county joined the city of Austin in 2014 with the goal of diverting at least 90% of discarded materials from landfills by 2040. To reach this goal Travis County created a Green Team that has helped increase the diversion rate of the waste produced by the county from 5% to 34%, Auckland said. The county also purchased recycling and trash containers for public spaces at county facilities in 2016. Recycling can also have a positive impact on the economy, according to a 2015 study done by the Texas Commission on Environmental Quality. During each stage of the process, from collection to manufacturing, economic activity is generated in the form of employment and workers’ wages, the report states. As someone who works with government entities on environmental issues, Dobbs said it did not surprise him that only 23% of the county’s parks have recycling. An unfortunate reality in Texas is that landfill disposal of waste is cheaper and easier than recycling, which has not been a priority for waste management, Dobbs said. Auckland said county staff will start the process of creating the solid-waste management plan in January. The plan will outline anticipated costs and provide a suggested timeline to expand recycling services, remove substandard containers, and implement uniform signage to designate waste and recycling receptacles. Improving recycling services and waste management across all the county-maintained parks will likely happen in phases, she said.